The full simplified catalogue of New Zealand and Ross Dependency stamps from the 1855 Chalons to the 31st of March 2019 with up-to-date prices as available online from this web site - accessible on your computer whether you are connected to the Internet or not. The CD-ROM or flash drive contains large colour photos of over 97% of all issues with explanations and illustrations explaining how to identify many key varieties and errors. New Zealand Revenue stamps are excluded, except where used for postal services. The CD-ROM / flash drive also includes up-to-date comprehensive listings of issues and stamps in over 50 .csv format text files ready to import into your favourite spreadsheet or database program. 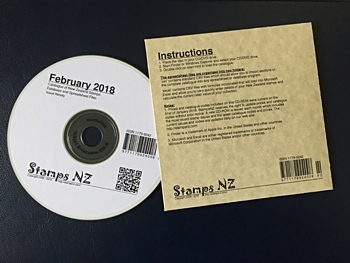 If you use Microsoft Excel, a second set of custom .csv files with built in formulas allows you to quickly enter details of your New Zealand and Ross Dependency stamps and calculate the full catalogue value of your collection. The catalogue is issued monthly and is compatible with computers running Microsoft, Apple and Linux operating systems. A working CD-ROM or DVD drive is required to read the CD-ROM. A working USB2 or USB3 port or hub is required for the USB Flash Drive. Prices, catalogue codes and content included are current to the last day of the preceeding month.